There are bunch of open source php forum softwares are available for you to install and use in your website, but if you’re using WordPress then it’s totally waste of time to install any other open source forum software to your hosting when you can create it with bbPress. bbPress is a forum plugin for WordPress from the creators of WordPress. bbPress is light-weight and faster than other popular open source forum softwares. So, it does make a lot of sense to integrate bbPress with WordPress for a smooth forum experience. bbPress is a plugin, so just like every plugin, you can install bbPress from the WordPress plugin directory or directly from your WordPress website. 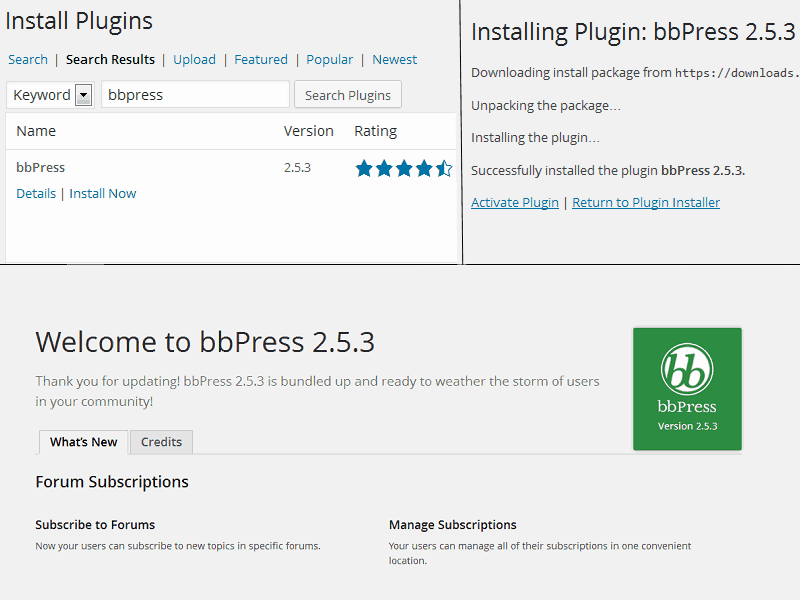 Just log in to your WordPress admin panel and go to Plugins > Add New & search for bbPress. Install and activate the plugin. After the activation, you’ll see the welcome screen for bbPress. After installing bbPress to your WordPress, you will see Forums, Topics and Replies menu items in your WordPress admin menu. Click on Forum > New Forum. This will take you to a forum creator, similar to WordPress’ post editor. Enter the title for your forum and enter a little description of it and click on the publish button. Now that you have successfully created a forum on your website, it’s time to display the forum on the front end of your website. Click on Pages > Add New. Give this page a suitable title for your forum and paste [bbp-forum-index] shortcode in your page. Now, let’s create a registration page for your forum. Go to Settings > General, and check the “Any one can register” option to allow registration on your WordPress and forum. Now, click on Pages > Add New. Give a suitable title to your registration page and paste [bbp-register] shortcode and publish the page. Just like this, you can also create login and lost password page for your bbPress powered forum. Add [bbp-login] shortcode to a new page to create a login page and [bbp-lost-pass] shortcode to another page to create a lost/recover password page. Make sure to turn off comments and trackbacks in these pages.